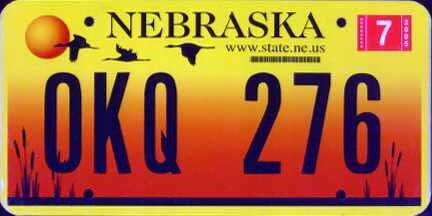 I don’t want to complain about the new Nebraska license plate design. I just want to comment. It looks rather pretty in this illustration. I guess I am a little disappointed by the design concept. The state bird and state flower, which are also endemic to many other middle-western states, doesn’t say a whole lot about Nebraska. I very much agree with a portion of the rant this blog poster shared. The State of Nebraska is missing a huge opportunity. The license plate is more than just a functional sheet of metal, it’s a branding opportunity. As the state tries to grow its tourism and change the perception of being a boring piece of flat land, it should think about all its touch points. Wow. Yeah. Thousands of Nebraska cars will be driving around advertising . . . a bird and (weedy, IMHO) flower that could be found in a bunch of other states. It at least has the iconic Oregon Trail covered wagon and the outline of the state and a little Husker font. Perusing some images of old plates on this website, I think my favorite past Nebraska plate is the one of the sandhill cranes flying over a marsh at sunset. True, the sandhill crane also lives in many other states. But the Platte River Basin in Nebraska is the main stopover point on the spring migration route of hundreds of thousands of birds. That’s unique. Yes, the western meadowlark has a beautiful call. But it’s hardly unique enough to draw people to the state. Happy trails to you, and may you give that Nebraska vehicle in front of you a following distance that devolves the license plate design into two indistinct yellow blobs. It’s better than the plates for pickups – they are white and say “Commercial Truck”. Like my Tacoma is a “commercial truck”…. Now I can see more clearly what folks are talking about! I have to disagree on just one point. In my experience, the meadowlark and goldenrod look like two very indistinct yellow blobs even from a tailgating distance…a close one at that. At a red light, I found myself inching closer and closer to try and determine what the yellow blobs were. Aaah! See? Now the Nebraska license plates are a traffic hazard. They ENCOURAGE people to tailgate! License plates should be like they are in California, Virginia and Massachusetts. Plain and simple, no web URL or to much graphic. If someone want more graphic they can buy a specialty plate. The plates are not suppose to be a billboard for the states web page. There is also no need in changing the plates so frequently. The new plates are horrible. Dull and ugly are not great features for a state that doesn’t have a great reputation by those beyond its borders. The older “sunset” plates were unique and you could spot a Nebraskan from many car lengths away. Not to mention they were metal and could stand up to the elements better. Unfortunately, the new plates are IMHO, no better than those they replaced. My gripe is I spend a lot of time on my cars, making them look good and run great. The worst plate we’ve ever had for a person who wants their car to look good is the one you posted as your favorite. On it’s own, I agree — beautiful imagery. On a blue or black car, it looks tteeerrrible. I’d love to be able to opt in to a black plate with white letters — it would look far better on my car, -and- be even easier for law enforcement to read. I am also not at all a fan of white, yellow and green, which is what we’re rocking now, as you pointed out above. If we’re arguing the aesthetic appeal of the plates, we need to remember they’re going on a wide variety of vehicles. Less is more, in my opinion. I just wish they had the county numbers on them–1 (Douglas), 2 (Lancaster) and 59 (Sarpy). We drove all the way across NE today and we’re trying to figure out what the yellow blobs were. I thought a penguin, but why a penguin from Nebraska? Finally recognized the flower when we followed a cat long enough and got close enough. We finally got to Iowa and decided to check the Internet. Hope you go back to sandhill cranes next time. Ah, yes, the Nebraska penguin. 😀 Thanks for the laugh, Christine! We were just driving behind a car with this plate in Dallas, TX and couldn’t agree with you more. I did a Google search to try and find out what the heck the design was.